When Jack and I decided to share our Perfect Prime Rib recipe here on A Family Feast – it wasn’t much of a stretch to also decide to share our Yorkshire Pudding with you! Yorkshire Pudding is a traditional English side dish served with roasts of beef like prime rib or top of the round. 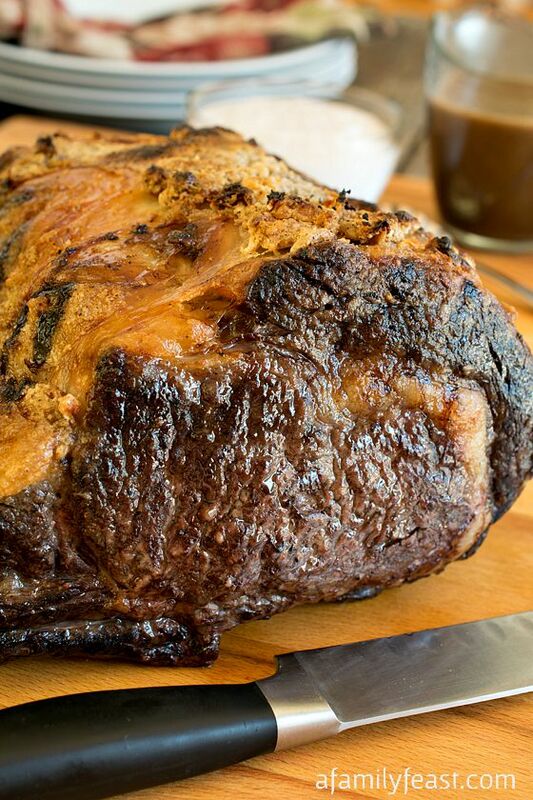 A simple batter is poured into a pan of piping-hot beef drippings from the roast – then baked until it puffs up. Once taken out of the oven, the “puff” collapses – and you are left with a soft, custard-like center and crispy outer edges. Yorkshire Pudding is absolutely heavenly! Make sure that the beef drippings are extremely hot. Once you’ve taken the roast out of the oven, put the pan with the beef fat back into the oven to heat up again. Make sure the batter is extremely cold. We typically chill the batter for at least two hours after mixing it up – or you can chill it overnight. While Yorkshire Pudding closely resembles a popover – the traditional way to serve it is to cut it into squares after it bakes. In olden days – Yorkshire Pudding was actually served before the roast (you can read more history here) presumably to fill the guests’ stomachs before the more expensive meat was served. Either way – Yorkshire Pudding is a must-make recipe to serve with our Perfect Prime Rib. Whisk flour, salt, eggs and milk to form a batter. Don’t worry about any lumps. Cover and refrigerate for at least two hours covered. After two hours, preheat oven to 450 degrees F.
Add beef fat to a 9X12 roasting pan and place in hot oven for 5 minutes. Quickly, pour cold batter into hot fat and close the oven door quickly. The batter will puff and rise with high and low areas. Do not open oven during this process but check progress through oven window. The pudding should take about 25 minutes but check after 20 minutes, again through the window. Once the batter stops puffing and the top starts to get browned, remove from oven and serve immediately with roasted prime rib of beef. Some of the pudding will deflate which is totally fine! Yeah, this is wrong. Your pan is the wrong size and it looks like the top is over-done and the bottom is under. Not an afficinato of YP except for the odd toad-in-the-hole though. You need to change your president and to metrics. Good luck. Happy New Year Paul! Thanks for taking the time to share your thoughts! This is a wonderful recipe and the most successful Yorkshire pudding I’ve ever made. Thanks Donna! So glad you enjoyed the recipe! Excellent! Easy to make and it turned out perfect. Thanks Craig – so glad you were happy with the recipe! Forget the beef, I am happy with just the Yorkshire pudding! We used to go to the House of Prime Rib in San Francisco when I was a child. I couldn’t wait to go back as I got older. There is nothing better than prime rib and Yorkshire pudding. Thanks for a great recipe! I’m with you – I’d be happy with just the Yorkshire Pudding too! Enjoy! Thank you for the recipe! This was my favorite dish for my birthday, that my dad used to make for me. He’s gone now and I forgot how to make it (we used to do it together) but seeing your recipe brought it all back. Dad used to make double batches because all of the kids in the neighborhood used to come over to watch it rise, then collapse! Then feast! It was awesome! No one cared about the roast beef, just the Yorkshire with gravy. Even good cold, it there was any left. We’d sneak down in the middle of the night and raid what ever was left over !!!! You’re very welcome Julie – what wonderful memories you have with your Dad! I hope our recipe is as delicious as you remember! Such wonderful memories for me with this Martha. Whenever my mom made roast beef, we always had a Yorkshire pudding!!! Haven’t had it in years either! This recipe is reminiscent of a yummy breakfast recipe: Dutch babies. Instead use butter melted in a pan and no salt. The recipe I use also calls for the eggs to be beaten until fluffy before the milk and flour are beat in. Serve with real maple syrup for a real treat! Yes – very similar Katya! Looking at your video it looks like there is more than 4 tablespoons of beef fat in the pan before you put the batter in. is 4T enough? Hi Susan – Great question and you are correct! We actually did put more than 4 tablespoons in the pan as we took those photos – and it was way too much fat in the end! When we finalized the recipe for our post, we cut back on the amount of fat in recipe. If you are making a large amount of Yorkshire Pudding in a larger pan – yes – you should increase the amount of fat – enough to generously coat the bottom of the roasting pan. Hope that helps! Thanks for writing in today! I just wanted to say that I love Yorkshire Pudding. I have not made it in a long time but after reading your recipe I will be making it only with beef stock from my roast. Thanks for the recipe. Thanks Henrianna – we hope it’s as good as the Yorkshire Pudding you’ve made in the past!